This Fall we have a very new silhouette appearing. It is certainly “out of the box” for most of us, but I think it’s refreshing and fun. There are layers,,some long some short, the legging look continues but in narrow pants with sometimes a short skirt in the same fabric. There are bold geometrics with angles. There are sheer fabrics over narrow pants...and more. So for starters I want you to sit and watch this video link and absorb the shapes...jot down words that come to mind and choose one silhouette that you like, one that you think would look good on you. I want you to design and make one, two, maybe three garments, to add to your Fall ‘12 and Winter ‘13 wardrobe that have the flavor of these fashions. This challenge is open to all sewing students, and we will meet in early 2013 to show what we have created. To help you in this process, here is the link for your inspiration from Chanel. There is a link for the show and for individual garments on this page. Chanel Ready to Wear Fall and Winter 2012. 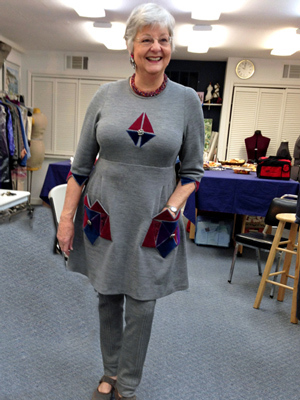 On Saturday February 16, 2013, everyone met at Jane's Sewing Studio for a Show and Tell of the garments they were inspired to create. Here are some of their garments. Enjoy the Chanel Challenge Slideshow.